In the meantime, I have some very lovely auctions for you. Please wait for threads to be made. Threads are now active! I come with a quick question I can't seem to find anything about! I've searched the tags, googled it, meditated on it, swam to China and back on it, all to no avail! So I'm hoping you guys can help me out. I have a kid. A grail kid, to be exact, and it has a few random, though small, marks and such about it. I'm curious if there's a good effective way to clean them? Or just a good way to clean kids in general? I'm also offering 10 slots out for them. I've gotten tons of new stuff, but I can't find my camera so I can't show anything yet. But I'll update with my Applause wants. The one that's practically life sized. I looked on YJA and there's absolutely nothing of Lucario on there, so I was wondering if maybe someone was thinking about selling one some day here. He should probably be worth almost a fortune by now, but I have the money to pay in separate payments. I don't have a picture of him sorry, but there has been people selling some in the past. Thanks to AAPF, here is the Kids set for August! Interestingly enough, with Meloetta's Pirouette forme being confirmed for this set, we still don't know what Pokemon could be obscured in the set in July. Not to mention, there are still a lot of obscured spaces in Banpresto sets this summer even with Meloetta's Piroutte forme being revealed. Do you guys think there's going to be a new forme or Pokemon? 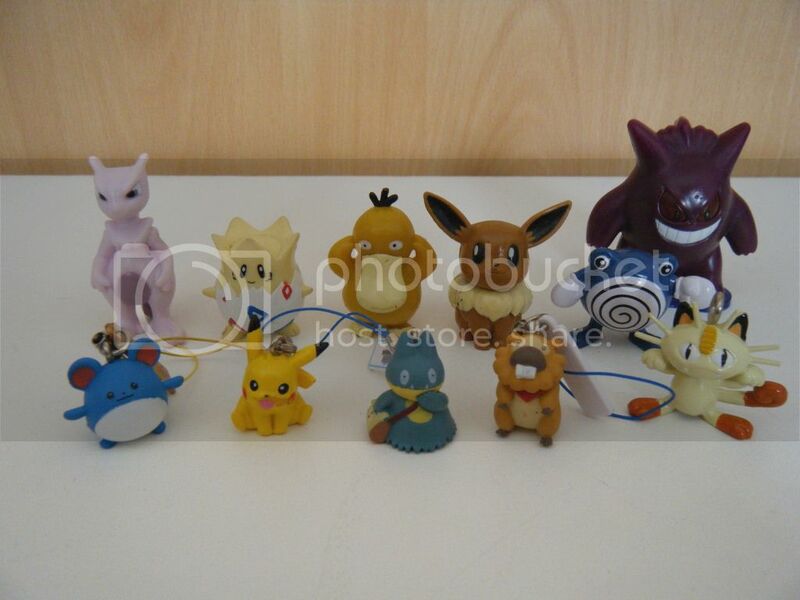 EDIT: New people goods being sold at the Pokemon Center on June 23rd!! Back on the actual topic of Pokemon, I got in my huge bunch of SMJ winnings and now I offer most of it to y'all!! Because I really want to move these things, I am starting each item at 25¢. I hope people can get some great deals on things they want and as many of these pkmns as possible can move on to loving homes!! WANT POST! ~ Flareon Canvas Plush (MWT) & Eevee Walky Umbrella! 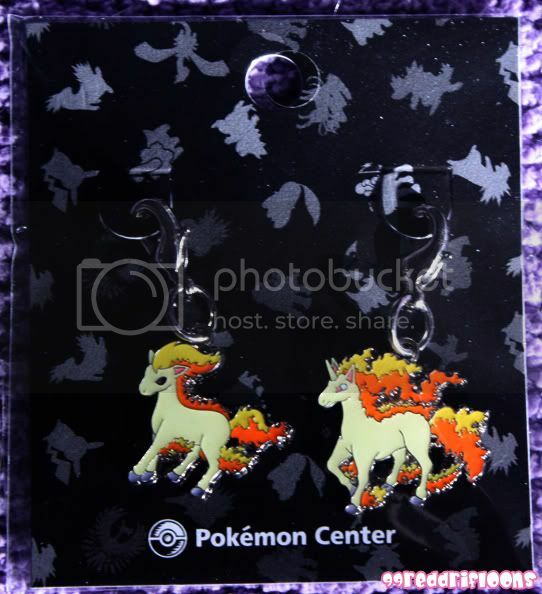 Buying: Flareon Canvas Plush & Eevee Walky Umbrella. 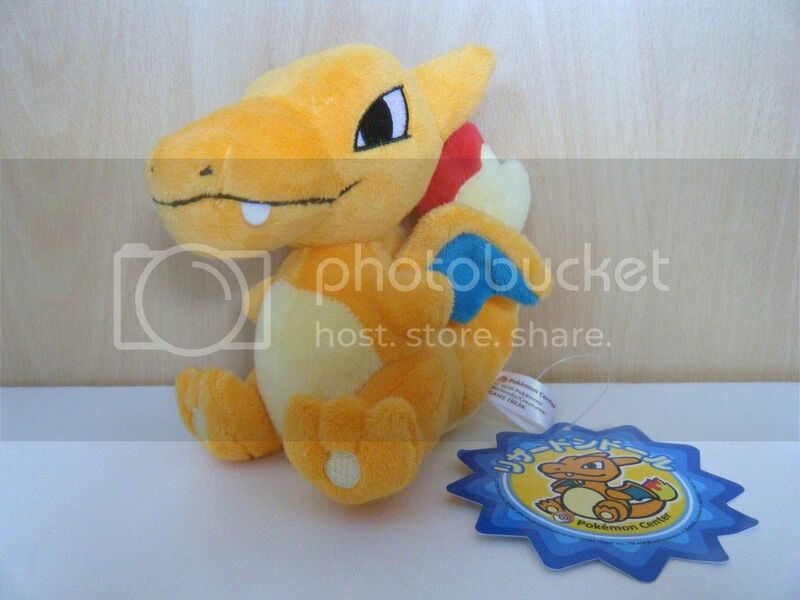 HOPING TO PAY $110 to $115 SHIPPED For The Plush. HOPING TO PAY $40-$45 SHIPPED Max For The Umbrella. My goal is trying to get all the legendary poke figurine! My range is that the figure have to be 2 inch with a stand or base on it! So the question is what legendary Pokemon that have a base? So far I got all the kaiyodo bottle cap Pokemon aka dialga, palkia, jirachi, Deoxys, Latias, manaphy, rayquaza Mewtwo. And I have chess piece of groudon and Kyogre and tcg figure like arceus, zekrom, Reshiram, and victini! And darkrai and giratina sky form from kaiyodo. Also per- realse figure of lugia! I know moltres articuno zapdos zukan hav a base and the three regi's but I don't know if regigigias have it? Or how tall it is? And heatran too? So yeah I been researching Pokemon I don't have and want to know if they have a base? And height? Gonna make this post short and sweet! 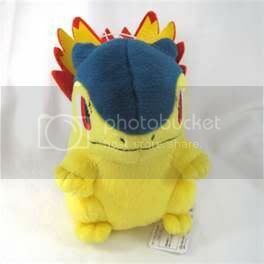 Does anybody have this Banpresto UFO Heracross plush that they'd be willing to sell, or know where I can find one?!? I was bidding on the one in the GA a couple days ago, but missed the ending and lost =( I'd also be willing to commission someone to get it from Y!J for me, as I don't use that website. He doesn't need to be MWT, but I'd like him in good condition. I'm willing to pay between $20-30, but would go higher if necessary. Thank you so much ivan_rathe!!!! More fun sales and auctions for even funner people! Feedback, rules, when I got sales permission, etc. Auctions end at 8:00 PM EST on Monday, May 21st. 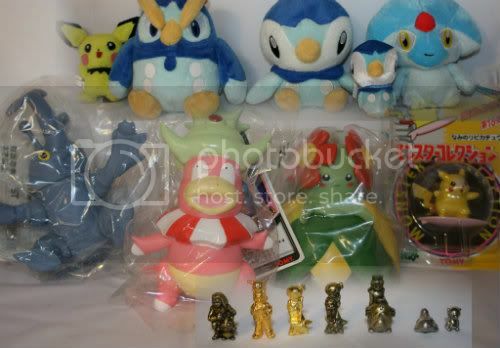 metal figures, plush, settei sales and more! Sales! Zukan, TFG, Kids, Plush and more! 2nd thing! Everyone who has sent payment or bought from me, your items are packaged up. I was going to take a batch of them out yesterday to ship however somewhere along my travels my bank card mysteriously vanished (which I can tell you is not the best thing to happen a few days before you go on holiday -_-) so I will be travelling to the nearest branch tomorrow along with a huge santa sack of pokemon so I can pay for the shipping <3 sorry about the slight delay guys. Zee spreadsheet of glory is under this 'ere cut. Hi everyone!~ So, I finally got myself organized and fixed up some of my sales post. I've added a few things to my normal sales, including Topps(?) cards and stickers, and finally uploaded all of my extra TCG! And also, don't forget about my commissions! I have 4 slots left for wallets this month! 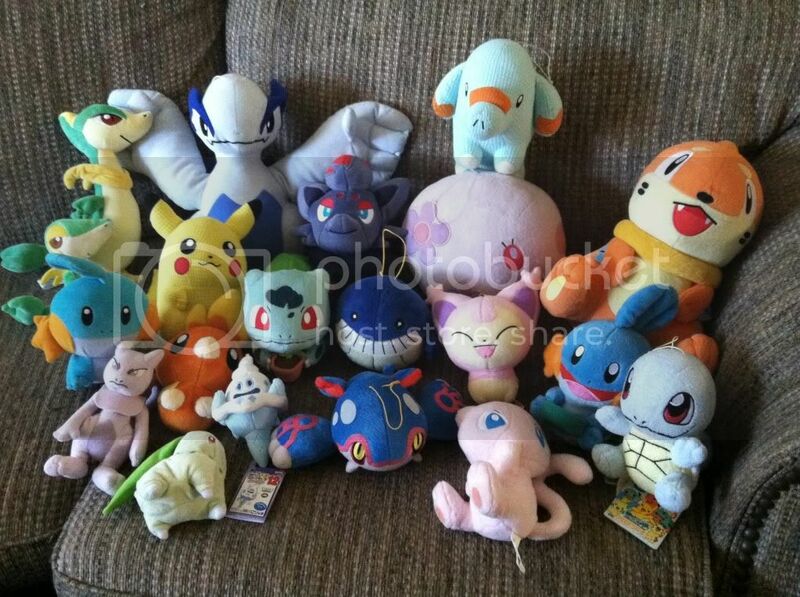 Also, still looking for a Oshawott throw plush! As promised I have uploaded videos of the English speaking pokémon speaking! I didn't realise that Snivy, Tepig and Oshawatt have three settings for speaking English, French and German! (Pikachu is the same in each language). This means Pikachu says 11 different phrases and the others have 11 options overall, but I believe this is over the 3 different languages. Here is a little pic of them with their TY buddies for size comparison! Anyways, I'd like to buy this for a friend who has a birthday coming up in June. 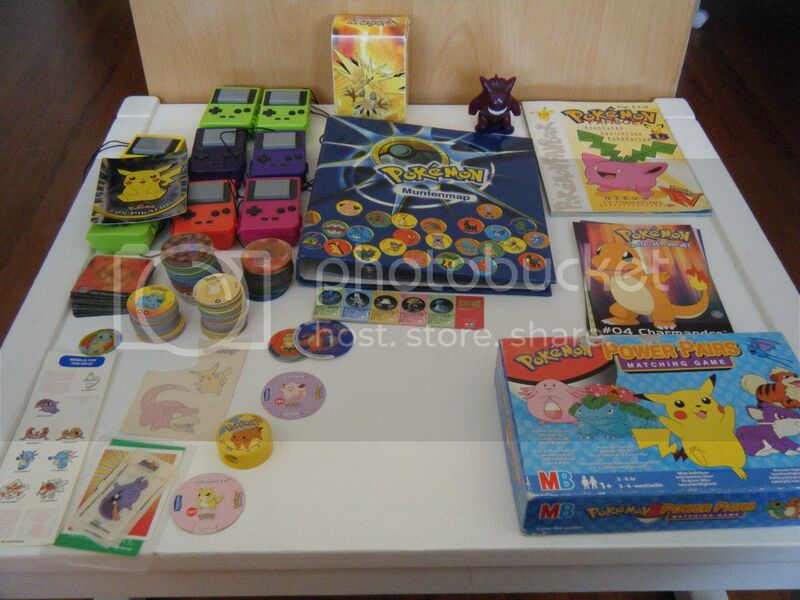 I've searched Pokevault, eBay, even Y!J, but I've had no luck! Does anyone here have one? I'm trying to spend $40 or less on this thing, if I can. It doesn't have to be MWT or anything, as she isn't a collector, she just loves Typhlosion. Please let me know if you have one that you're selling, willing to sell, know anyone that's selling this, or if you know a site where I could buy this. Has anybody seen this Japanese puzzle on sale anywhere or has it and is willing to sell it? I really like the original artwork and would be very interested in it. 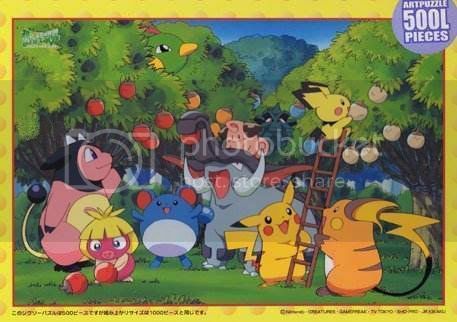 Hey guys, just a reminder of the pickups that I will be doing for some Poke center goods including: Clearfiles, Notebooks, Pokedolls, Canvas, Mini-Pokedolls and more! Just a quick post to let you know that ive just chucked alot of stuff up on ebay as a huge lot incase anyone was interested in GA'ing it.